A few weeks ago, I was sitting home alone and for whatever reason decided to watch Tidying Up With Marie Kondo on Netflix. I remember being swept up the last time Kondo Fever hit a few years ago, and thanks to her, my dresser drawers are neat, and I swear by folding my clothes into tidy thirds. Surely, I had absorbed everything there was to the KonMari method – my Brooklyn apartment is pretty organised, and unlike most of the people on her show, I know where everything is. Except when I shut off the TV and picked up my phone to tweet that more people needed her than Jesus, I realised that while I had cleaned out my physical spaces a long time ago, my digital clutter was out of control. I had over 150 apps downloaded onto my iPhone 7, all sorted into confusing folders across seven screens. There were seven text messaging apps – LINE for friends in Japan, WhatsApp for the other international friends, KakaoTalk for family in Korea, Signal for my journalist buddies, the default Messages app, Facebook Messenger, and Hangouts for Google. If you added video-chatting, I had 11 apps dedicated to gabbing with friends and family. There were a whopping 21 apps for controlling various aspects of the smart home, including eight for robot vacuums I no longer had in my possession. I had 11 apps for various types of note taking, to-do lists, and reference. For some reason, I had 10 apps for photo-editing and video apps. There were 36 mobile games, four food delivery apps, and seven rideshare apps – far too many to be practical. If you had asked me where I could find a specific app, I would’ve turned into the shrug emoji. I’d been reduced to searching for any app I was trying to use. Arranging my apps meaningfully also meant deleting most of my folders. For me, folders had become an app-hoarding crutch. I’d slide an app into a folder and forget it was even there. So, I deleted all but six. 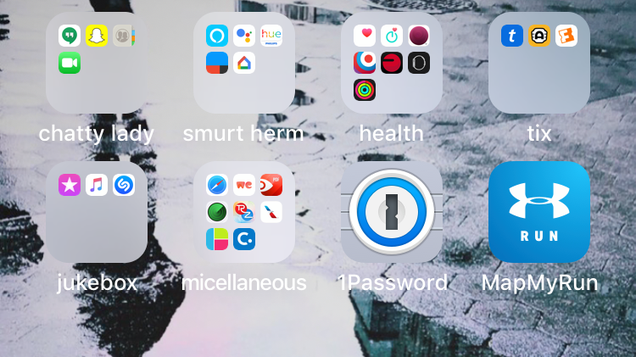 And for the folders I kept, I made rules that each needed to have at least three apps to justify its existence, but no more than nine so I could see every app in a folder without opening it. Kondo teaches that you should fold your clothes into thirds so you can actually see everything in a drawer – and the same logic applies wonderfully to apps.